I wrote about the Masked Rider novel from this issue yesterday, as part of the Forgotten Books series, since I read the paperback reprint of it. But here's the pulp cover, and it looks like the issue is a good one overall. In addition to Donald Bayne Hobart's entertaining lead novel, there are stories by Johnston McCulley, Allan K. Echols, Sam Brant (a house-name who could have been anybody) and my old friend, editor, and mentor Sam Merwin Jr. his own self. Sam wrote mostly science fiction and detective stories, along with some sports stories and even a few romance yarns. 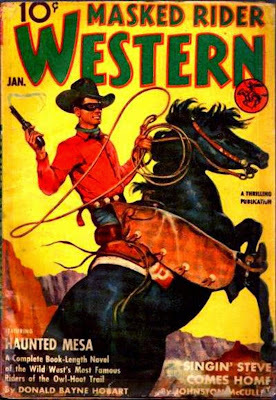 He seems to have been least prolific in Westerns, but I'll bet his story in this issue is a pretty good one.